1) The Exposition (or Introduction) – this provides the background information needed for the reader to understand the story that follows. Classically this is where the problem that needs resolving is posed. 2) Rising Action – As the story builds on from its introduction it is further complicated during the rising action stage. Here various obstacles can be put in the path of the protagonist to complicate the process. Also secondary conflicts can also be introduced as either sub-plots or secondary antagonist characters (that perhaps connect to or work with the main antagonist). The aim of this section is to prevent a simple and quick resolution to the main problem of the story. 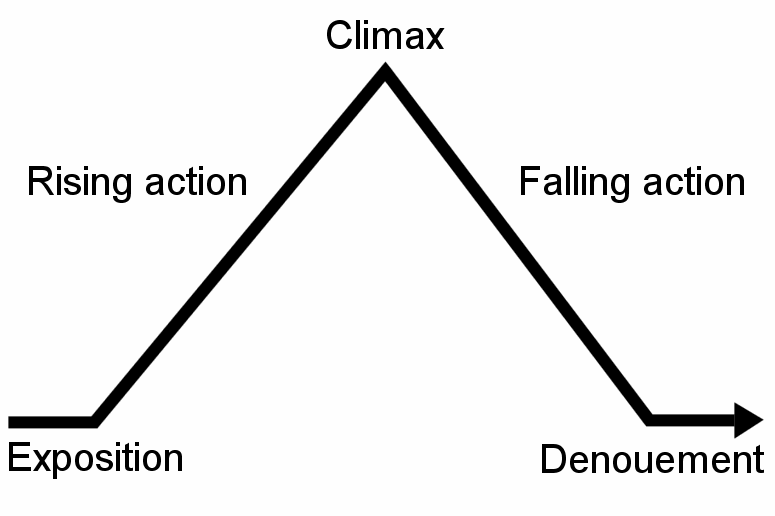 3) The Climax – Today we tend to see the climax as the ending of a story but in Freytag’s pyramid the climax sits in the middle of the work. This is the turning point of the story, the point that marks a change in the protagonists situation, be it for better or for worse. As the word ‘climax’ suggests though this part of the story should be the most dramatic moment. It should see the culmination of the problem set in the exposition. 5) The Resolution – The ‘Denouement’ or resolution is the ending of the story where the main problem and narrative becomes finally resolved. The resolution can be extremely varied and does not necessarily need to see a happy or fully resolved ending occur. Freytag’s Pyramid still has use today but it should be remembered that Freytag was trying to structure and explain Old Comedy and Shakespeare in his own day. Primarily his rules were laid down for those writing for the theatre and stage but they still have value to those of us writing in modern forms today.